« Poker can be an educational experience. If you've been reading our blog for the past two years 1) why? and 2) you may remember I do a holiday gift guide every year. Well, it's not even December yet, and I've already seen literally dozens of gift guides, some are even pretty decent. So, this year, I'll just point out the great work being done by other sites, as there's so much of it, and I'm so lazy. To start it off, I had to go with NotCot. 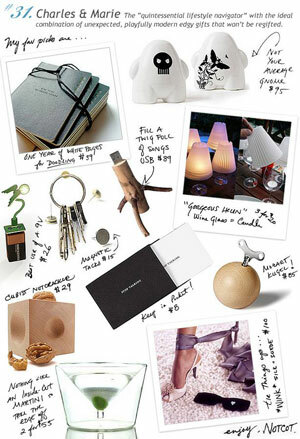 NotCot has been one of my daily must-reads for years, and their gift guide does not disappoint. For the holidays, NotCot is posting an entire month of suggestions, with a different theme every day, in all price ranges. Here's the first day, which features the store Charles & Marie. You should check it out, and go back often if you're looking for gift ideas.